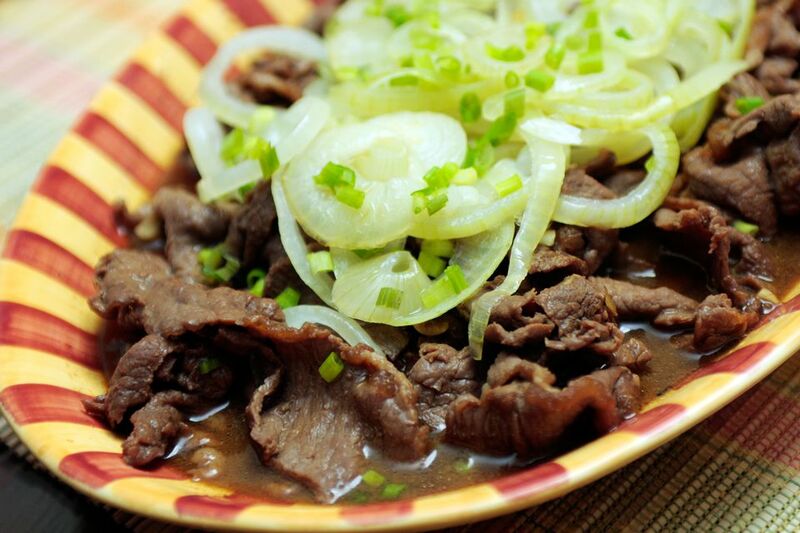 Bistek could be an adaptation of American beef steak or the Spanish bistek. Either is possible because the Philippines was a Spanish colony for more than 375 years and an American possession for more than four decades. Although garlic is not a traditional ingredient of bistek, the spice adds depth of flavor and tempting aroma. The amount of citrus juice in the ingredients list is approximate because calamondins (spicy oranges of the Philippines), limes and lemons have varying degrees of acidity. Slice the beef thinly; about 1/8-inch thick or less is ideal. Place the beef in a shallow bowl. Pour in the calamondin, lime or lemon juice, and soy sauce. Add the black pepper and minced garlic. Mix thoroughly but gently so you do not tear the meat. Cover the bowl and place in the refrigerator for at least an hour. Drain the beef and reserve the marinade. Fry the onion slices just until softened, remove from the pan and set aside. Add the drained beef when the oil reaches its smoking point, spreading the slices to cover the bottom of the pan. Cook just until the underside changes color and then flip the meat over. Add the reserved marinade to the pan. The water that the meat will expel during cooking and the marinade will form the sauce for the dish. Cook the meat in the marinade, and when it is no longer pink, scatter the sliced onions on top. Cover the pan and let it cook for about 5 minutes more or until cooked to the desired doneness. Sprinkle snipped scallions over the cooked bistek before serving, if desired.